“Ask Jesus to Increase Your Faith”, by Rev Samuel Mametsa, Mphambo Crusade, Day 6, the 29th of March 2012. 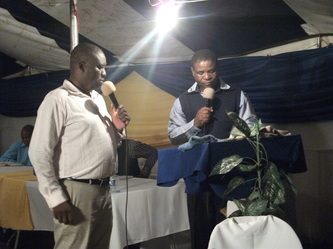 Rev S Mametsa prophesying, as per God's will, on hosts, Ps Masinge and his wife. Why faith? Because you can’t believe in God without faith. What is the meaning of faith? It is something that you cannot see but it is something you can see. This sounds like a conflicting statement. Faith is frustrating many Christians. You can’t see faith when it is exercised but you will definitely see the results of that faith. When I read Luke 17: 5 I remember one of the apostles asking Jesus to increase their faith. The challenge with faith is that it is something you can’t see. FOR ALL I WILL TRUST HIM. This means if you trust Him it doesn’t matter whether you see Him or not. “All” means everything. Luke 17:5 “5 And the apostles said to the Lord, "Increase our faith. "” Luke 17:5, NKJV. The bible says in Romans 1: 17 “17 For in it the righteousness of God is revealed from faith to faith; as it is written, "The just shall live by faith. "” Rom 1:17, NKJV. This means that faith is very important in your life. Without faith you can’t walk and become a real Christian. Where do we get faith? The bible says in Romans 10:17 “17 So then faith comes by hearing, and hearing by the word of God.” Rom 10:17, NKJV. Hearing builds your faith. In other words, when you come to Christ Jesus and hear the word the word of God will increase your faith. When the word of God is preached it makes you to believe and after believing, your faith starts to emerge. When again in church you are disciple you start to grow and your faith increases more and more. The bible says in James 1:6 “6 But let him ask in faith, with no doubting, for he who doubts is like a wave of the sea driven and tossed by the wind.” James 1:6, NKJV. In James 1:6 the bible says if you doubt and you don’t have faith, don’t expect to get something from God because God wants your faith. How can one demonstrate faith? People don’t understand faith and that is why they don’t get what they want from God. If I want to switch off the light in the room I press the switch button not the light bulb. When I switch off the light, I press the off button and the light will go off but I can’t see how it works. Just like faith, you can’t see how it works. Why do I have to go to press the switch and not the bulb? When I press the switch I don’t look at the button I look at the light bulb. You only see the action (results) when the light goes on or off. The same goes on with faith. How do you switch on your life and make it bright? When you believe and have faith in Christ. Then you are switching on your life. The light will shine. Your life will be brightened. In faith we see action. The bible also says James 2:17-18 “17 Thus also faith by itself, if it does not have works, is dead. 18 But someone will say, "You have faith, and I have works." Show me your faith without your works, and I will show you my faith by my works.” James 2:17-18, NKJV. Remember during the time of creation, God said let there be light but He never looked at the sky and ask “Where is the light?” He just continued as he has faith that what He has said will happen. With faith that thing will happen, it will come to pass. People have a problem. When they ask God for something they expect to see it happen. “When is God coming with my things? I have asked and it is not coming.” When God says something He forgets about it, the same goes for people with faith. They say it, or they ask Father it and forget. One day it will happen. Some say: FOR ALL I WILL TRUST HIM and they turn around and grumble. That grumbling will cancel your faith. Without faith you can’t enjoy Christianity. If you want God to work for you, prophesy what you want to happen in your life and ask God for it and forget about it. The bible says our God is a miraculous God. He doesn’t give you something you expect, He wants you to forget what you have asked and after you have forgotten He will give it to you. He is a God of surprises and when comes He will give you more than you asked or expected. This is because He is God. Faith moves mountains. We need to have faith. The bible says Romans 14:23 “23 But he who doubts is condemned if he eats, because he does not eat from faith; for whatever is not from faith is sin.” Rom 14:23, NKJV. The bible says if you do something but with doubt then you are sinning. I want to motivate you on faith. Once you can stick to your faith, you won’t be moved and the devil cannot move you. If there is something that the devil fears the most, it is a person who sticks to his faith. Then you become enemy number one to the devil. Let me tell you a something: Many people are misinterpreting the word of God, when a Christian dies they say the Christian has been killed by the devil. The Christian has not killed by the devil or his demons. What the devil does is to make sure that he sends his demons to make you to fall or to sin. The devil will never kill a committed Christian, once he can kill you as a Christian he is sending you straight to heaven. First, he must make you backslide because he knows that when you die you will go to hell. Then he will be happy. If a demon can kill a Christian it will have a tough time from the devil as he will be angry with that demon “Why are you sending this person home?” The devil is not happy with the death of a Christian but when a backslidden Christian dies he has a big party celebrating his victory. Daniel 3:16-26 “16 Shadrach, Meshach, and Abed-Nego answered and said to the king, "O Nebuchadnezzar, we have no need to answer you in this matter. 17 If that is the case, our God whom we serve is able to deliver us from the burning fiery furnace, and He will deliver us from your hand, O king. 18 But if not, let it be known to you, O king, that we do not serve your gods, nor will we worship the gold image which you have set up." Saved in Fiery Trial 19 Then Nebuchadnezzar was full of fury, and the expression on his face changed toward Shadrach, Meshach, and Abed-Nego. He spoke and commanded that they heat the furnace seven times more than it was usually heated. 20 And he commanded certain mighty men of valor who were in his army to bind Shadrach, Meshach, and Abed-Nego, and cast them into the burning fiery furnace. 21 Then these men were bound in their coats, their trousers, their turbans, and their other garments, and were cast into the midst of the burning fiery furnace. 22 Therefore, because the king's command was urgent, and the furnace exceedingly hot, the flame of the fire killed those men who took up Shadrach, Meshach, and Abed-Nego. 23 And these three men, Shadrach, Meshach, and Abed-Nego, fell down bound into the midst of the burning fiery furnace. 24 Then King Nebuchadnezzar was astonished; and he rose in haste and spoke, saying to his counselors, "Did we not cast three men bound into the midst of the fire?" They answered and said to the king, "True, O king." 25 "Look!" he answered, "I see four men loose, walking in the midst of the fire; and they are not hurt, and the form of the fourth is like the Son of God." Nebuchadnezzar Praises God 26 Then Nebuchadnezzar went near the mouth of the burning fiery furnace and spoke, saying, "Shadrach, Meshach, and Abed-Nego, servants of the Most High God, come out, and come here." Then Shadrach, Meshach, and Abed-Nego came from the midst of the fire.” Dan 3:16-26, NKJV. Here the bible tells us about people who stick to their faith irrespective of the situation. You can’t have faith if you don’t know the one you believe in. I remember Jesus asking His disciples who He is because He wanted them to be sure of who He is. If you want to have faith first check who you are serving. People lack faith because during the day they come to church and worship God but during the night they go and consult the sangomas. Before the Israelites were taken to Babylon they were worshipping God and when they arrived in Babylon they didn’t compromise their faith. When the king in Babylon heard they were Christians he wanted to test their faith. He erected an idol and instructed the people to worship the idol but Shadrach, Meshach, and Abed-Nego said “We do not worship any other God. There is a god we worship, the living God.” When the king heard about it, he was furious. “I have heard about the Israelites who don’t want to bow down to my god”. When they were called they refused to bow, they said “We are not going to bow, we serve a God who is alive.” Their faith was tested. “I am warning you, tomorrow all the people in this people are going to kneel before my god.” King Nebuchadnezzar said to the three Hebrew boys. These three did not buy the face of the king, they expressed themselves with honour. They said “Oh king, we respect you very much, but what we will never do is to bow down to that idol.” When they started to speak and said “Oh my king”, King Nebuchadnezzar thought they were surrendering; his shoulders were going up straight to pump up his ego and pride. When they continued and said “Unfortunately we will not bow to any of the gods in this place” he looked down and felt threatened, dishonored, surprised, disrespected, furious. He was filled with fury and told his people to set up a fire seven times stronger so that when the Shadrach, Meshach, and Abed-Nego come to be thrown down into the fire, the fire will just consume them in a moment. They were adamant “We will not bow down to any other god”. The king said, “Unfortunately there is nothing I can do to save you, we are throwing you into the fire.” They said “It is fine, our God will save us”. I remember when Jesus was about to be crucified, he prophesied about his death and said some of you here will betray me. Peter said “Not me, I am going to die with you, wherever you go, I will die with you.” There is lot of Christians who said we will die with Christ, but when the storms and the wind came, they were moved. When the time came and Jesus was arrested and tormented Peter was behind him and when the one lady said “You were with him,” he denied and he ended up remembering what Jesus had prophesied that “You will betray me”. A lot of Christians are betraying Jesus, when the situation is bad they deny him. We need to ask Jesus to increase our faith so that when the things are bad we must not deny and betray Him. King Nebuchadnezzar said there are three people who are denying me; they must go into the fire. That was a very strong fire. The people who pushed Shadrach, Meshach, and Abed-Nego into the fire were consumed by the fire. Shadrach, Meshach, and Abed-Nego were thrown into the fire. The king was moving up and down, anxious, waiting but when he looked he saw four people in the fire and they were moving around and he was surprised “This has never happened before”. Are this people not in the fire? How come are they moving? Didn’t we put three men inside the fire, how come I now see four people?” He never asked anybody but on his own the king deduced that the fourth one was an angel. God will never betray the people who have faith in Him. If you walk in faith He will send his angel to protect you. The work of the 4th angel is to defuse the power of the fire. God sent the angel to touch the fire and to make that fire ice. Shadrach, Meshach, and Abed-Nego started to praise God in the ice (fire), they called him by His different names and the more they praised Him, the fire lost its power. In your prayers the more you continue to intercede, the more the fire and the more no demon will be able to stand before you. The more you pray the more God will diffuse what is before you. This is faith. Don’t compromise your faith. A lot of Christians have a lot of faith when there is trouble before them but when things are right they relax. When children are at school, they have a lot of faith but when they go to tertiary level, they lose their faith in God. You will see that during the tertiary holidays they won’t even come to church. This is the time when their faith is tested. Job 19:25-27 “25 For I know that my Redeemer lives, And He shall stand at last on the earth; 26 And after my skin is destroyed, this I know, That in my flesh I shall see God,” Job 19:25-26, NKJV. Job was a God-fearing man. When the devil was roaming around, God could see that the devil was up to something. He knew that the devil wanted His servant Job and God said to him: “Satan, where are you going?” He says “I am just roaming.” God says “Did you see my servant Job?” “Oh, so Job is your servant? He is your servant only because you are protecting him, if you can stop protecting him You will see his true colours.” The job of the devil is to roam around. Why? He is looking for Christians who do not have faith so he can devour them. The devil was looking for Job and that is why he said to God “That is why you have put a hedge around him”. The devil was not able to get through the hedge and needed God to lift it up. 1 Peter 5:8 “8 Be sober, be vigilant; because your adversary the devil walks about like a roaring lion, seeking whom he may devour.” 1 Peter 5:8, NKJV. Can God trust you just like He trusted Job? Can He trust you even in the dark? People think when they are in the dark God is not there. Do you think God cannot see you when you are jumping out of the window? Can He give you His oxygen and not know what you are doing? This man Job was trustworthy even after the hedge was taken away. I remember that God said “You devil, it’s fine, you can take my servant Job but don’t touch his soul, his spirit.” God can allow the devil to torment you, but He will never allow the devil to touch your soul or spirit. The devil felt it was not enough and struck him with a disease, he had a lot of sores, he was smelling. Even the dogs were running from that smell but he was alive and the bible says his friends and relatives said to him “Just insult this God and die.” They were insulting him but Job said “I know that my Redeemer lives!”. They said to each other, “They have bewitched him.” Some said to him “There is another sangoma in such and such a place who can cleanse you of the sickness” but Job said “I know that my Redeemer lives.”How many can say this? When the situation is tough. When you are in serious pain and they say to you “Let’s go to the sangoma”? Some of you will say “Eish, it has been long since I was in pain,” and you will be in such a hurry and say “Let’s go” and you will even end up dying there. Why, the devil can see you have lost your faith and you have backslidden. I remember in one family, one of their family members was very sick, they said “We have taken him to so many churches.” I said but you have never come this side. They came to me on a Friday and we agreed that they will come back to the church on Sunday for deliverance. I told them “I will pray for him so that this man will live until Sunday when he will come for deliverance.” I warned them that they must not go anywhere or to any sangoma as they will kill the man. One relative came to them on that very same Saturday and convinced the family to take the man to a sangoma. 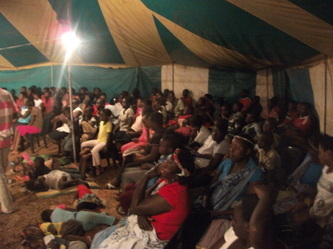 They told him “The pastor said that he will die if he goes to a sangoma” , he told them “Pastors love money too much. Don’t listen to him.” They went to the sangoma and he received treatment and afterwards, about three hours later, the man fell asleep and never woke up. People let us learn to stick to our faith.